Hey youuuuuu guys! 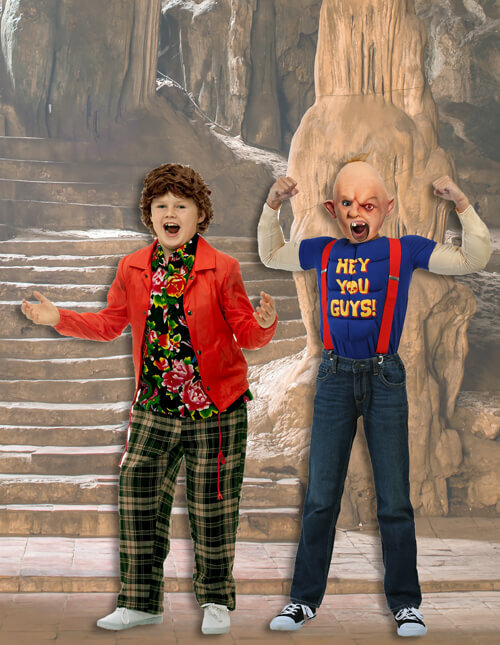 We have a whole bunch of Goonies costumes for you and your crew of rough-and-tumble friends and the best part is, you don't have to follow a treasure map through boobytraps in order to get your hands on them. Although you can always go on your own treacherous adventure if you so choose! If you and your pals decide to try hunting for One Eyed Willy's gold dubloons instead of candy, we'll let you in on a little secret: you will have more success if you dress like the Goonies characters that you love. (We'd also like to add that we admire your determination!) Lucky for you, we carry costumes that will transform you and your crew into the Steven Spielberg characters that you know so well. We have a Sloth costume, Chunk costume, Mouth costume, Andy costume, Brand costume, and a Data costume. All of these officially licensed costumes are exclusively made by us so you can't get them anywhere else but here, plus they are crafted from high-quality fabrics so you can definitely put the costumes to use more than once. 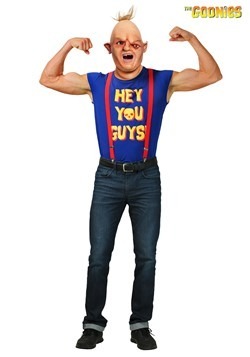 It's the perfect group costume for those who often get nostalgic for the popular 80's movie! Goonies R Good Enough. We think Cyndi Lauper was on to something there, because we're pretty sure the motley band of youngsters featured in the 1985 cult classic Goonies are good enough to accomplish almost anything. Outsmarting the Fratelli's? Easy. Finding One Eye Willy's treasure? No problem. Saving the Goon Docks from all but certain demise? All in a day's work! Of course, we're sure that any Goonies adventure is going to involve a few truffle shuffles, some zany inventions courtesy of Data, and a whole bunch of Mikey's steadfast resolve mixed into the scenario. If you're looking to relive some of the magic of this 80s classic, then you probably have your eye on going in a Goonies Costume. And, if you're like the typical fan making their first foray into character costumes, you might not know where to begin. But, that's what we're here for. 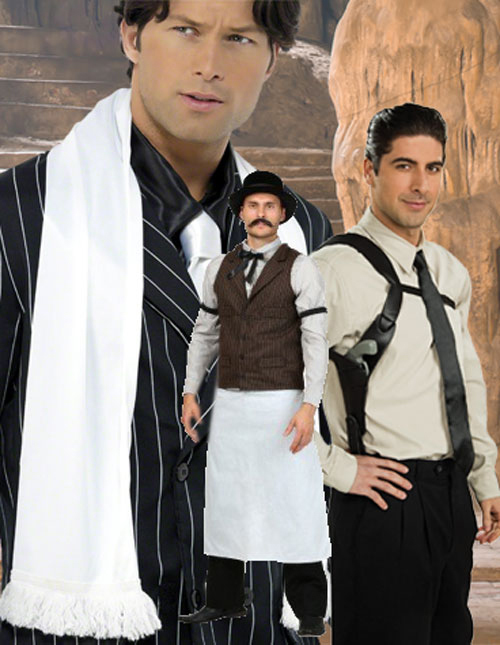 Our knowledge of all things costume means that we're not just the top shopping spot, but that we've got the expertise and the know-how to help you make sure you get the costume experience just right. And with that responsibility in mind, we are happy to present you with the HalloweenCostumes.com How-To for Goonies Costume Ideas! Our exclusive line of Goonies costumes for Halloween are officially licensed, and we have all of your favorite characters. Check out our How-To sections to help you choose which Goonie is good enough for you, or peruse or ideas to create your own Fratelli costume, Sloth Costume, or even ideas to let you be the fabled pirate One-Eyed Willy! We also have a few key accessories that will let you create the perfect costume or help you create your own Goonies scene with themed decor. You can also use our costume ideas, tips, and tricks to help you assemble the perfect group theme. We're sure there's going to be a whole lot of "Hey you guys!" when you get your gang together! Going as a Goonie might be cool any day of the year to most fans, because what kind of day couldn't use a little fun straight from the Goon Docks? But of course, there's one day that stands above all others when it comes to Goontastic fun. Halloween! The costume holiday is tailor made for the group of kids from Astoria, Oregon. The only question though, is which character is right for you? 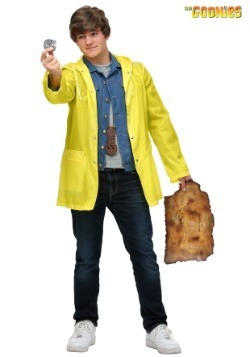 A Chunk Goonies Halloween costume will let you fill up the night with truffle shuffles. 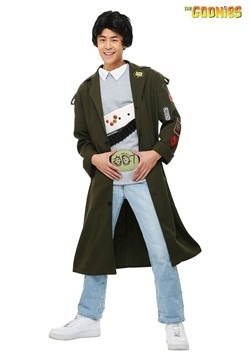 Or going in a Data costume would let you save the day with all kinds of zany contraptions. Or you could be Mouth to portray to the witty comb carrying Goonie, or of course, put on the yellow raincoat to be the de facto leader Mikey. Whether you're planning on finding One Eyed Willy's treasure or just getting the gang together to go to the costume party with a great group theme, we're sure it's going to be a "never say die" kind of costume adventure! "I got a great idea. Slick shoes!" There's seemingly isn't any situation where Data's inventions can't save the day, and if the self-appointed Agent 007 of Astoria doesn't have the equipment to solve the scenario, we can't imagine who would. 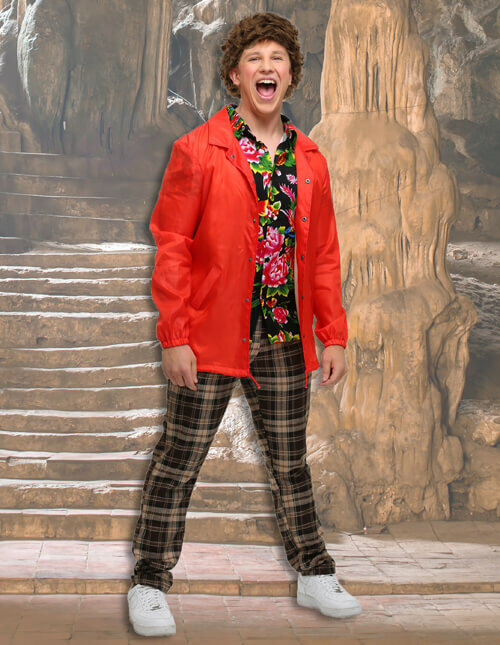 This Data costume is officially licensed, and is from our exclusive Goonies line. 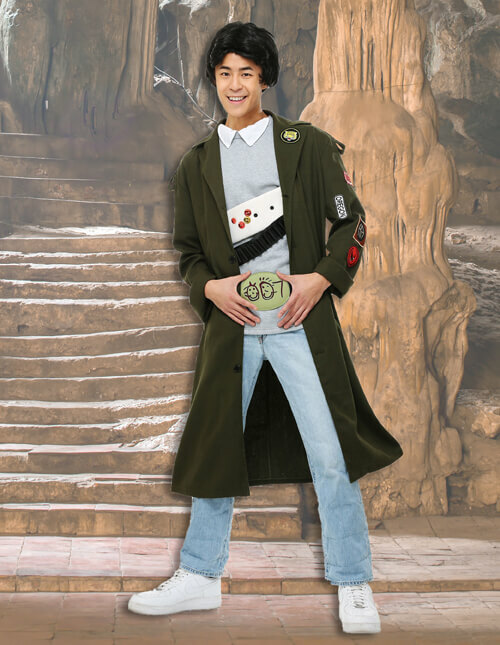 It doesn't quite pack the "punch" of actor Jonathan Ke Quan's movie look, but this costume is sure to be good enough for your own gaggle of Goonies when you coordinate as part of a great group theme. The best part about this costume is that it lets you add your own custom DIY accessories. Pro tip: Put some stuffing beneath your shirt to make it look like you're carrying around a ton of zany inventions! Mikey is 100%, for-sure just the kind of kid we'd want to raise. He might not be big and strong like his brother Brand, but he's got all the heart in the world, and he's ready to do whatever he can to save the day. You can step into the role of Michael Walsh with this Mikey costume. 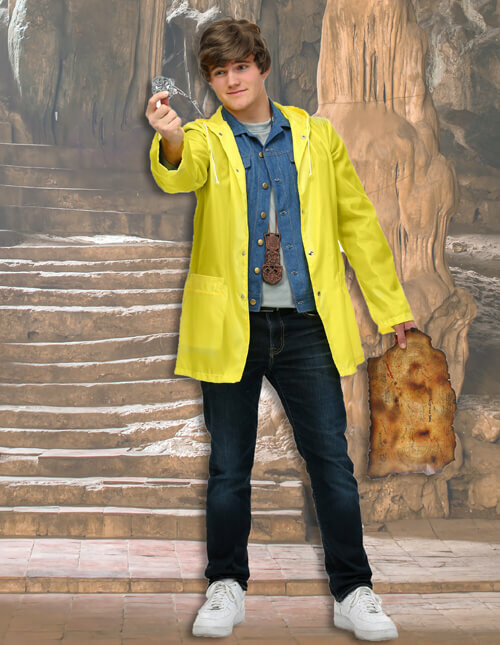 This exclusive adult look features a denim shirt and yellow rain jacket that are totally 80s, and if anyone's not convinced you're a Goonie, all you'll have to do is bust out your treasure map, skull key, or doubloon. Mikey might be an asthmatic, but don't worry about bringing an inhaler along, cause "Oh, who needs it!" With this costume, we're sure you'll be able to find "the rich stuff!" Whether you think you might be needed to poorly translate Spanish to a housekeeper or you're ready to let everyone know that you're taking a wish back at the bottom of the Moss Garden wishing well, you're sure to only want to be seen in one costume: Mouth! 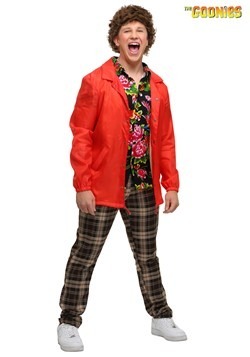 The jacket and wig set will give you the signature look of Corey Feldman's character, and if you can find a Prince shirt to upgrade the plain black tee that's included, well, we're sure that will take your Goonies costume credibility through the roof! The comb is included, so all you'll have to do is slick back that hair and maybe you might even get to try to order some veal scaloppini or a good fettucine Alfredo! He might be a tad hyper, a little paranoid, and way too fond of ice cream, but as for Chunk? We love him! Of course starting an adventure with a truffle shuffle is sure to endear any character to a fan's heart, but for Gooniesheads, Chunk is the memorable character that stands out even after all these years. 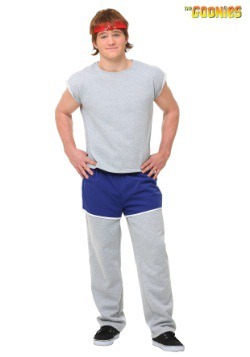 You can recall this classic 80s hero when you don his signature threads by getting our authentic costume. 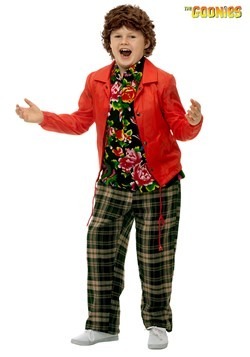 Who else would pair a Hawaiian shirt with plaid pants other than this lovable wise cracking candy bar totin' hero. 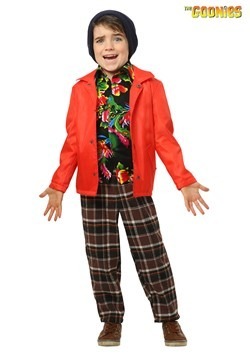 Going in a Chunk Goonies Halloween costume is sure to make your 80s theme party all the better! Sloth is cool. Like super cool! Sloth Fratelli is just the zany type of hero that takes the Goonies film from classic to unforgettable in a hurry. He goes from being chained up in the basement and stuck watching Errol Flynn in Captain Blood, and he ends up living out that kind of action on the deck of One Eyed Willy's ship! If only every character had that kind of Story arc. 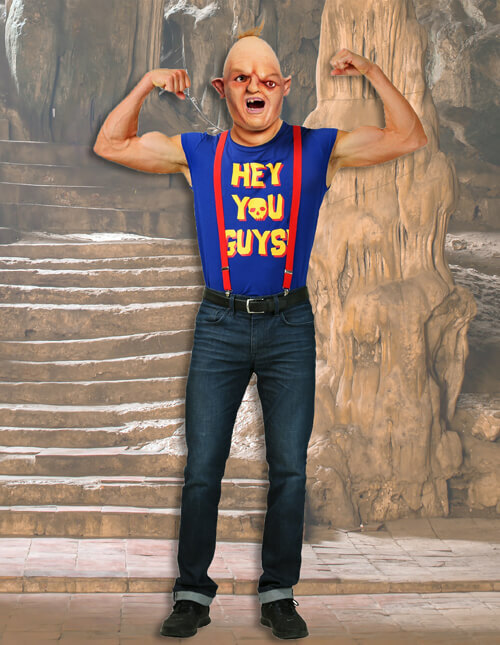 NFL star John Matuszak brought Sloth to life with five hours of makeup effects every morning, but you can skip all that muss and fuss with one of our exclusive Goonies Sloth Halloween Costumes! 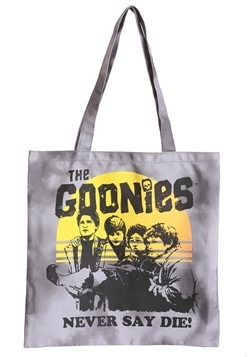 With all the character details you know and remember, you'll be able to round out a Goonies group or family theme with the classic character in authentic style. We're not quite sure what to make of Sloth the first time we see him, but by the time he teams up with Chunk and the pair split a Baby Ruth bar, well, that's when he becomes a fan favorite. And when the shirt comes off to reveal that he's wearing a Superman t-shirt? Well, that just takes him over the top! Of course our Sloth Costume comes with a signature The Goonies Hey You Guys shirt, but that's just because we think the unique design adds a fun touch. But you're free to use whatever t-shirt you like with this costume! The signature latex mask will complete your transformation into the Fratelli brother, and you can even add a Pirate's hat and sword to customize your look. 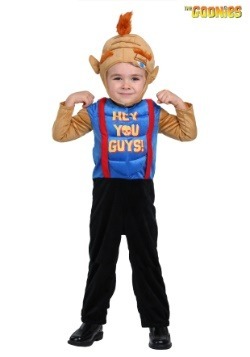 So you love the Goonies, and by now, you're obsessed with the idea of a Goonies themed Halloween. But if you're just looking for a couple's look or the best choice for a pair of buds, you might not be quite sure which characters to choose! Check out these popular choices, Andy and Brand for a couple's look, or Sloth and Chunk for kids. "Sloth loves Chunk" after all, and nothing says it like going in costume! Andy has a pretty big crush on Brand and Brand is all about reciprocating the attention when he has the opportunity! Whether you and your lady are serious or you just spend your time courting in a hidden cavern, our exclusive Goonies costumes will have you portraying this classic 80s teen couple. Our Andy Goonies costume has all of the character details of her cheerleader look down to a tee—even including Troy's letter sweater. She'll have no trouble sending the sweater back up with Troy's bucket when she sees you in your authentic Brand costume. Brand might have just been wearing his typical workout duds, but you won't even need a chest exerciser to bring this character to life. Just hit the town with her in the Andy costume, and you'll be ready to go on a date hunting for One Eyed Willy's ship! "Hey you guys!" Lawrence "Chunk" Cohen and Lotney "Sloth" Fratelli became more than friends by the end of the film, goshdarnit, they were like brothers! Who would have thought that bonding over a Baby Ruth could lead to brotherly love? 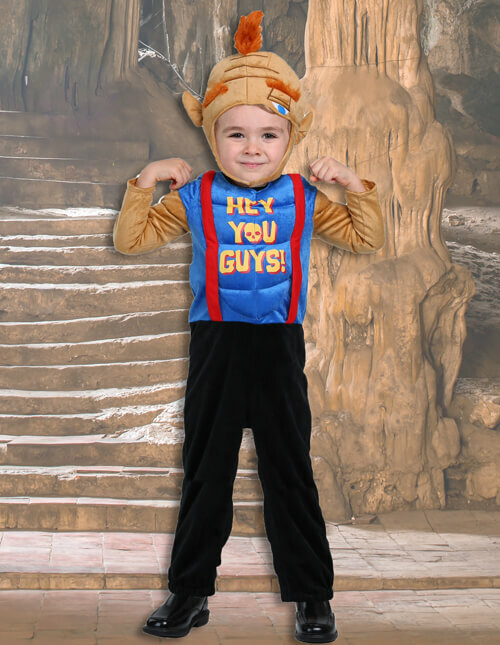 If you have sons of your own or just a couple little BFFs, a boy's Sloth and child Chunk Goonies costume combination would be the perfect way to dress your little ones in an adorable and instantly recognizable costume. Whether they're already huge fans of the Goonies (Grade A parenting there!) 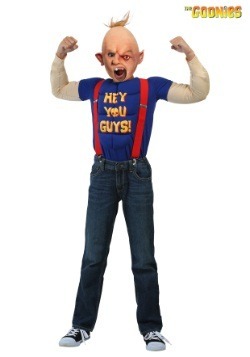 or you just want to relive a little 80s magic vicariously, any pair of boys will look adorable in these Goonies costumes. The latex Sloth mask and muscle effect will turn a little guy into monstrous character Sloth with ease, and all you'll need to have is a miniature Chunk in your household will be to teach them to do the Truffle Shuffle. But that'll be easy, right? Maybe trying to save the day isn't quite your thing. Maybe you're more into counterfeiting and being a small time crook! If that's the case, then it's sure to be the Fratelli life for you. Whether you think you have the pearls and the lead foot to become Mama Fratelli or would like to be one of her thug sons, we have some Goonies costume ideas to help you recreate your own movie look. With some good selections and a little bit of Do It Yourself attitude, you'll be able to be become one of Astoria's most wanted. For good measure, we've even got a One-Eyed Willy costume, if being a skeleton pirate is actually more your thing! Instructions on DIY booby traps and how to hide your pirate ship , however, are not included. One-Eyed Willy managed to protect his ship, The Inferno, and all his stores of gold (aka the rich stuff!) for all these years. So we're not surprised that Mikey went out of his way to make sure the deceased pirate got to keep his share! If you'd like to be the stuff of legends, why not just go in a One Eyed Willy costume? 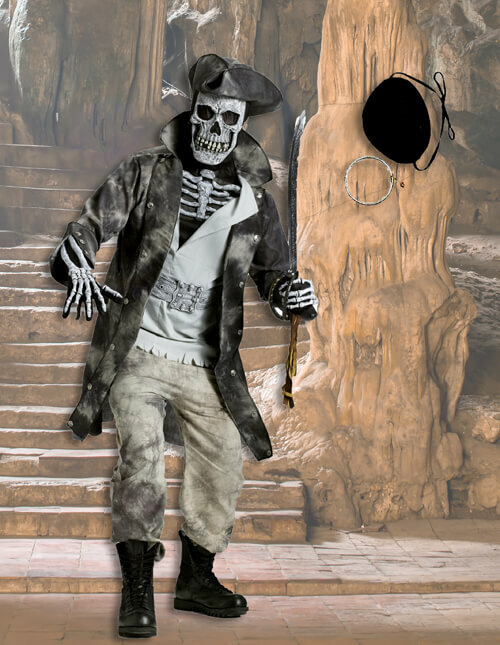 The perfect way to keep expanding your Goonies Halloween costume group theme, we would suggest our Ghost Pirate costume to portray a convincing Willy. But just don't forget to grab an eyepatch accessory! When you join the group as this legendary buccaneer, you might not have the skills to create expert level booby traps, but we're pretty sure your deceased skeleton costume is going to be bringing the scare factor! She's a tough customer. She wears pearls. She drives a four-wheel deal, real neat ORV. She's Mama Fratelli! Of course, she's the leader of the Fratelli gang, and when her boys, Francis and Jake are up to no good, well, you could sure say that the Fratelli's are at it again! She don't take no gruff, and you won't have to either when you assemble your own DIY costume, you'll be able to wheel down Canon Beach on your getaway! Just use our pleated costume skirt along with your own black shirt to create the look, and then customize with accessories like her signature pearl necklace, a black beret, shoes and gloves! 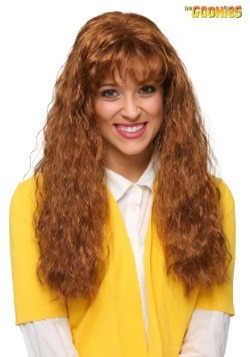 Pop the clutch and take this look for a spin as the leader of your themed costume group. If you're looking to bust out of the slammer and get the family gang back together again, you’ll have no trouble becoming Jake Fratelli with a few easy costume pieces. Just grab the vest from our Old West Bartender costume, and wear it over your own salmon or plain white long sleeve shirt. Then just use our Gangster Gun Holster and Gangster Scarf to complete the Goonies costume look. You might need to work on your opera singing, but when you’re out at the Lighthouse Lounge Restaurant, they’ll be plenty of time in the basement with Sloth for that! "You want your pepperoni?" 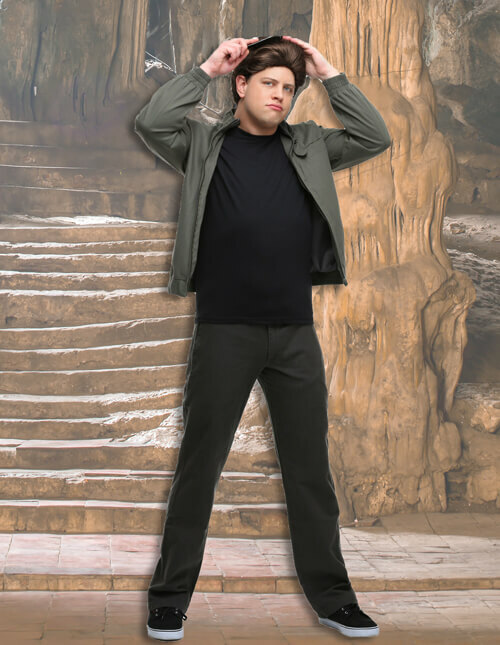 He might have a quick fuse, but Francis Fratelli is the sharpest dressed member of the gang if you ask us. (Even though Superman t-shirts are pretty sweet!) All you have to do to capture Francis's look is add a few signature touches. The same vest and gun holster work on both Jake and Francis costumes, but all you need to do for Francis is make sure you have a dark button up dress shirt and a few key accessories. 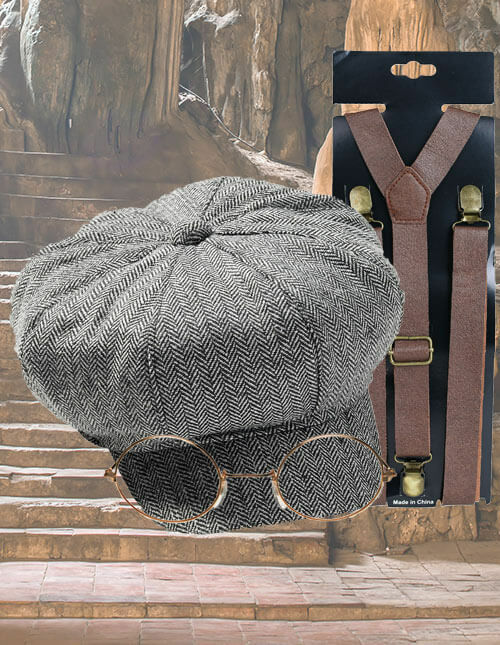 Our Tweed Newsboy Hat and Round Rimmed Glasses will give you the signature character touches for your costume. You can also use our Leather Suspenders instead of the gun holster if you prefer! Want to take the Goonies fun to another level? Just add some fun accessories to your group, party, or scene décor. These props will be as cool as saying "Sloth loves Chunk." Trust us! "That's what I said. I'll set booby traps in case anyone follows us!" 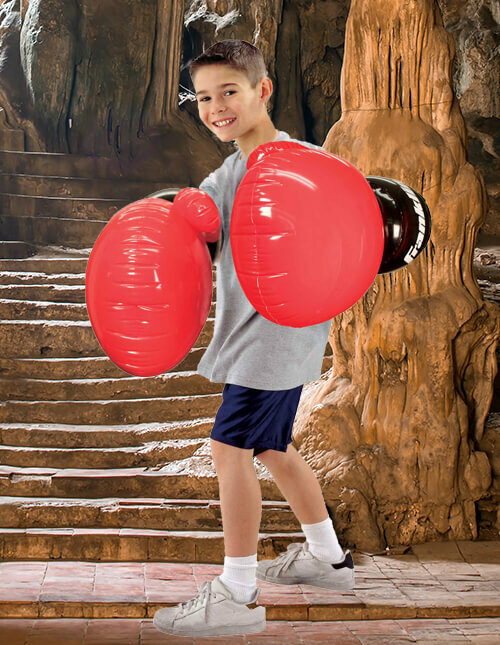 Data's boxing glove sure came in handy knocking down Jake Fratelli in the cave, and while we haven't quite figured out how to make one yet, you pickup these Inflatable Boxing Gloves to add a fun décor piece or use them as an accessory for your Goonies costume. You can't set up a Goonies theme party without One Eyed Willy's treasure! 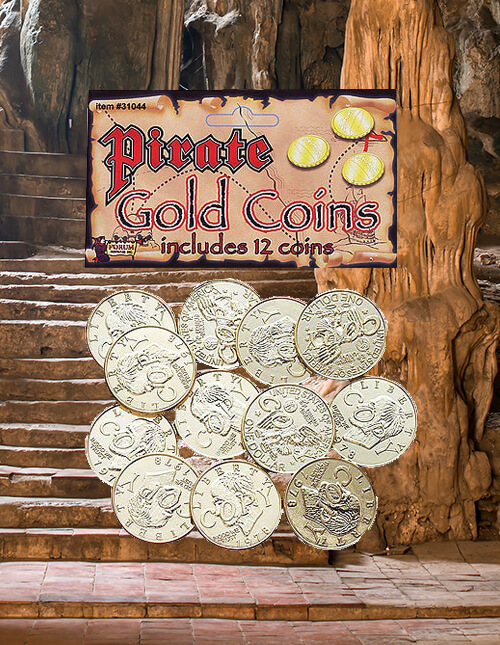 Whether you're having a themed Goonies party or just want to create a memorial to the brave Chester Copperpot (may he rest in peace) this set of 12 pirate coins will help you create plenty of "the rich stuff!" "No, it's Captain Chunk." Have no fear, because Captain Chunk is here to save the day! All it will take to rescue the Goonies is Chunk outfitted with a tricorn pirate's hat and a cutlass. And maybe some help from his new friend Sloth too. 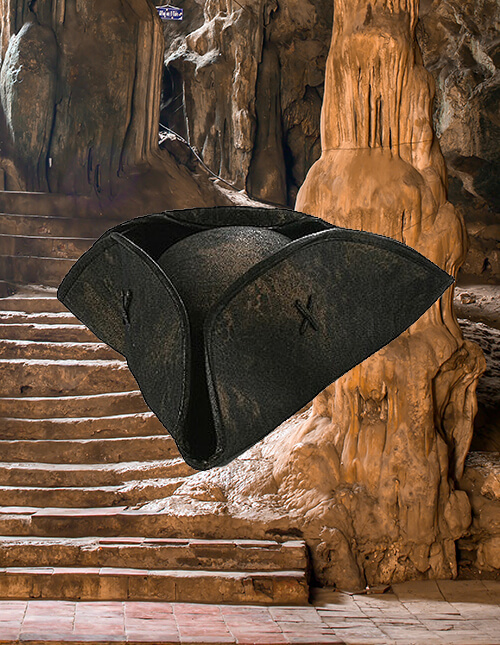 Add this hat to your Chunk from the Goonies costume, and you'll be ready to save the day! This awesome doubloon magnet and key bottle opener set comes with our exclusive Mikey costume, but you can also pick them up separately. 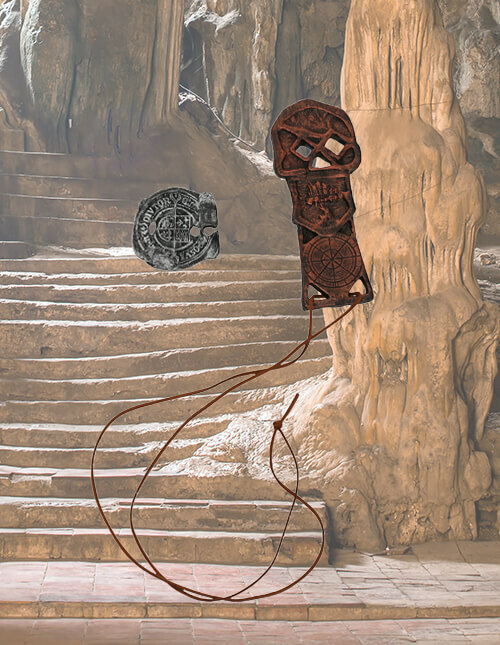 These signature replica accessories are officially licensed, and made by us, so you can use them to complete your own custom Goonies Mikey costume or use them to help you find the rich stuff. "It fits, Mikey! It fits! We got it! We got you, One-Eyed Willy!"